Read about the plays below. 30% - £ 10.00 OFF FROM THE TOTAL VALUE! 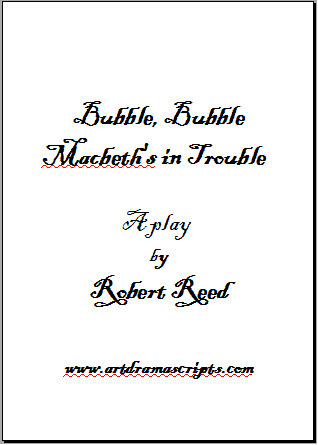 Very funny comedy / parody of 'the Scottish play'. (Year 7 - Year 8, 6th-7th Grade). Macbeth is persuaded to get rid of the old King Duncan by sabotaging his Zimmer Frame... However, the witch's prophesies don't turn out quite as Macbeth expected. Please read the description above. The play is suitable for performance by students aged 13-16 (Years 9-11, 8th-10th Grade). There is a total of 9 roles (6 with doubling; 2 F, 1 M). The run-time for the performance is 35 minutes. Macbeth is persuaded to get rid of the old King Duncan by sabotaging his Zimmer Frame. However, the witch's prophesies don't all turn out quite as Macbeth expected. So, who will ultimately be wearing the crown of Scotland when the 'hurlyburly's' finally done? Including performance rights and rights to copy for the cast*! NARRATOR: The two exhausted armies fought remorselessly like spent swimmers clinging together trying to choke the life from the other. Finally, victory fell to the Scots, with their general Macbeth the hero of the day. BANQUO: The terrible memories of today's battle shall never leave my mind.What say you, Macbeth? BANQUO: We defeated the foes of King Duncan. You were in the midst of the enemy's ranks throughout the fighting. What did you think was happening? MACBETH: I thought it was just a big rough and tumble game of medieval football against those Norwegian lads. But, the referee certainly wasn't in control, and it was very confusing: fair is foul and foul is fair. BANQUO: So, it was you who kept calling out for a penalty? MACBETH: Absolutely, but nobody took any notice... I shared my oranges with the Viking boys at half-time as well. They were a bit fierce, but nothing scares me. MACBETH: Aghh! It's a feeble old woman! WITCH: (Pointing with crooked finger.) All hail, Macbeth! Thane of Glamis and Thane of Cawdor! MACBETH: (To Banquo.) I think she's talking to me. 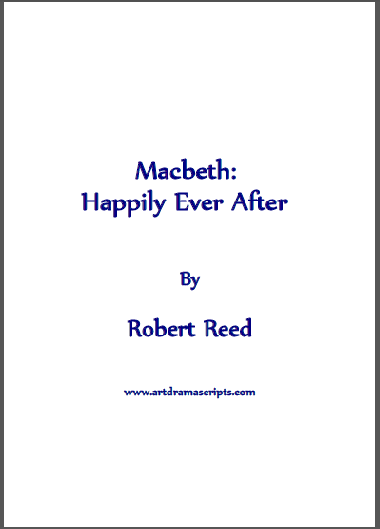 MACBETH: Woo-hoo! To be a masseur! WITCH: NO! To be King of Scotland, you muppet! (Clears throat.) Oh, and Banquo, thou shalt get kings, but not be one yourself. Okay, it's bingo night, so I can't hang around here any longer... And, Macbeth think very carefully about the implications of what I said. Double, double toil and trouble; fire burn, and cauldron bubble!